Day 2047 - Friday, Hooray! It's also the last workday of September. It's also the LAST day I have to use our current timesheet system at work, it is getting replaced. THAT is a goodness. I don't know about YOUR week, but MY week just flew by! That's a good thing, except I don't feel that I accomplished everything I wanted to this week. Charlie is going to meet me after work today for a workout and then out to eat, maybe for more Cajun food. Now THAT's a nice way to start the weekend off with a bang. Day 2046 - I Know Where Fruitcake Goes!!!! Greetings, Bloggy Fruitcake Lovers and Haters! I have solved one of the mysteries of the universe. I should get a prize. I KNOW WHERE ALL THOSE TONS AND TONS OF FRUITCAKE GO AFTER THE HOLIDAYS. 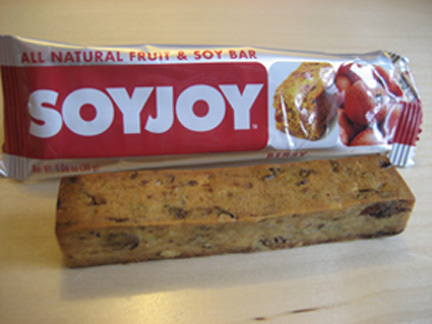 They are secretly loaded onto trucks, and delivered in the dead of night to the people at the SOYJOY Factory. There, Holiday FRUITCAKE is magically transformed (with heavy equipment) into a dense, dry, health strip... that tastes just like old fruitcake. No, I didn't even PAY for the bar I ate, they were giving them away FREE and I still haven't gotten over the taste. Day 2045 - Go Away, You Brut! If there's one thing that makes me ill, it is the smell of strong cologne or perfume. Charlie used to wear 'Canoe' sometimes, but stopped wearing it because I preferred just the smell of soap to ANY kind of cologne or aftershave. 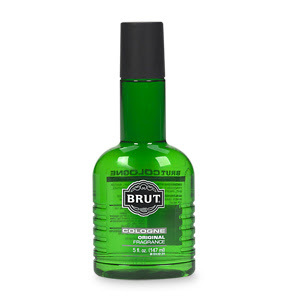 The other day at work, someone came back at lunchtime from the gym with a fresh application of Brut cologne. At least 4 people in the vicinity (me included) were absolutely poisoned by the smell of it. Word to both men and women - if you must use cologne or perfume, PLEASE use it very sparingly. Thanks in advance! 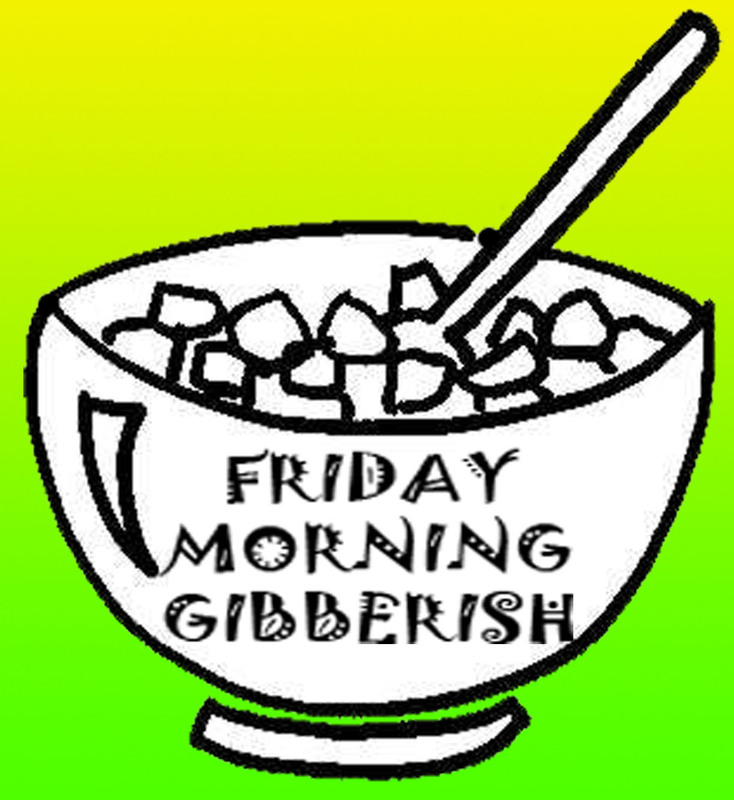 Greetings, Bloggy Field and Streamers! I know that bar codes are useful, and a great invention, but face it, they’re kind of BORING. One little strip with black and white lines on it can uniquely identify just about anything. IF the bar code is cataloged in a computer system, that is. Bar codes weren’t invented when nature decided to make everything unique. Have you really NOTICED ‘nature identification’? It’s very cool. 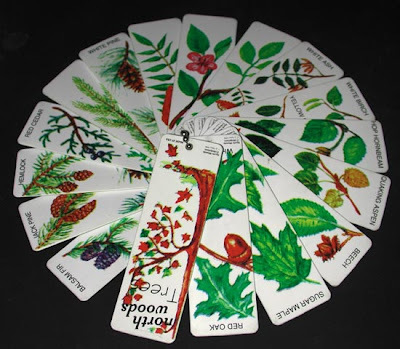 Each seed, leaf, nut, and blossom is unique and identifiable. Even among trees, acorns and pine cones and pine needles and bark are all different. Even snowflakes are all different. 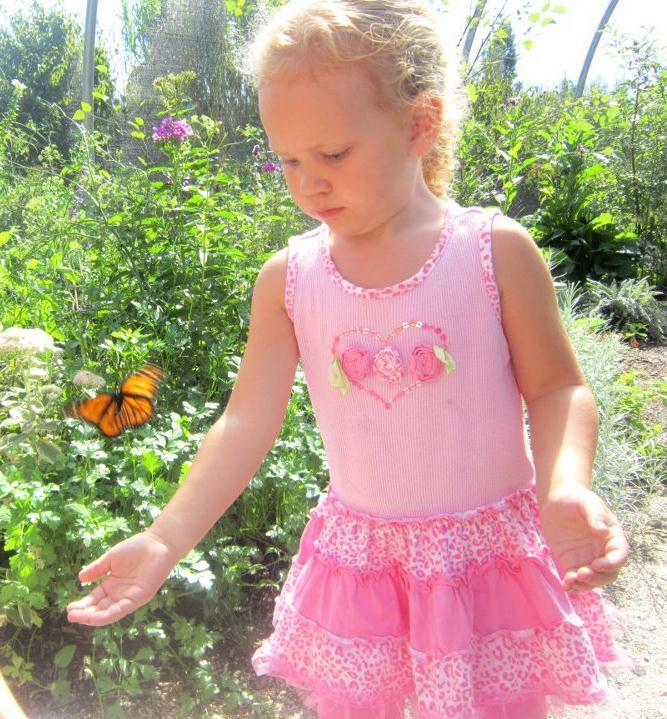 This blog idea arose when Charlie and I were researching Ragweed vs. Goldenrod. They are very different, even though most people confuse them because they are flowering at the same time. Mother Nature ROCKS, dontcha think? Your homework is to get a field guide or peruse the web and go LOOK AT NATURE. Day 2043 - I Can't DECIDE!!! 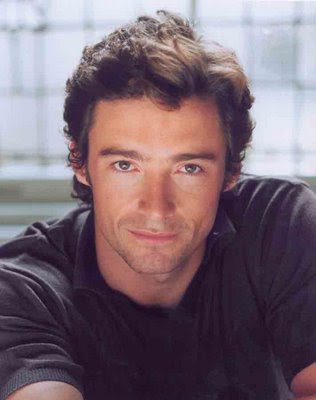 I can't decide whether I prefer to moon over Hugh Jackman, or Clint Eastwood (as he looked many years ago). You can't deny they are (or were) both rugged and handsome. 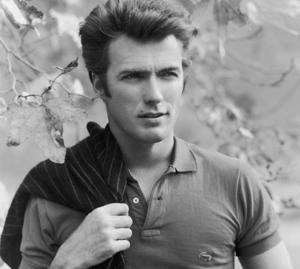 YES, I know that Clint Eastwood is over 80 years old, he was born in 1930. I've had a longer moonage with Clint Eastwood. I loved his western movies and Dirty Harry movies and 'Every Which Way' movies. As a matter of fact, my ex-husband told me once 'I don't like the expression on your face when you look at him!' HA! I hope to enjoy watching Wolverine and other characters he may play for years to come. Okay, move over, Clint and make room for Hugh. 'Nuff said. In addition to BILLS, we get various promotions and offers. 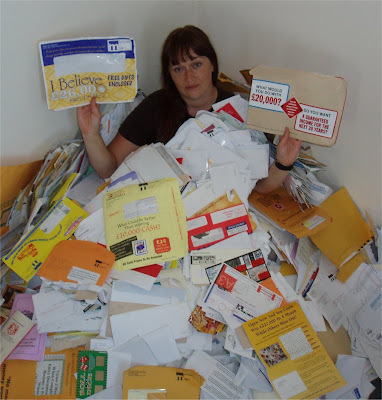 They could be credit card offers, timeshare resale ads, car ads, and bank promotions. Lately I've had TWO recent rounds of junk mail that is made to look like something is EXPIRING that needs to be renewed. I've had multiple mailings that told me my car warranty was going to expire. It wasn't. I've had multiple mailings that the freezer warranty about to expire. It wasn't. BOTH are trying to SELL me something, not renew something I already have. Day 2041 - An APP(lication) a Day Keeps The Doctor Away! Parents surf the net with their kids for free apps, then they download them, and try them out. My manager mentioned that he and his son like to do that on 'daddy days'. 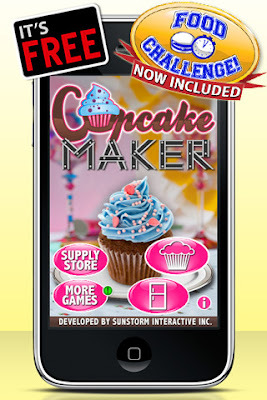 A colleague at work mentioned yesterday that his daughter just got a 'cupcake app' and a 'pizza maker app'. That is hilarious to me, because those are just the kinds of things we USED to buy via sticker books or colorforms. Kids go everywhere with expensive iPads instead of coloring books, and they know how to use them too! Day 2040 - Fall Has Arrived! 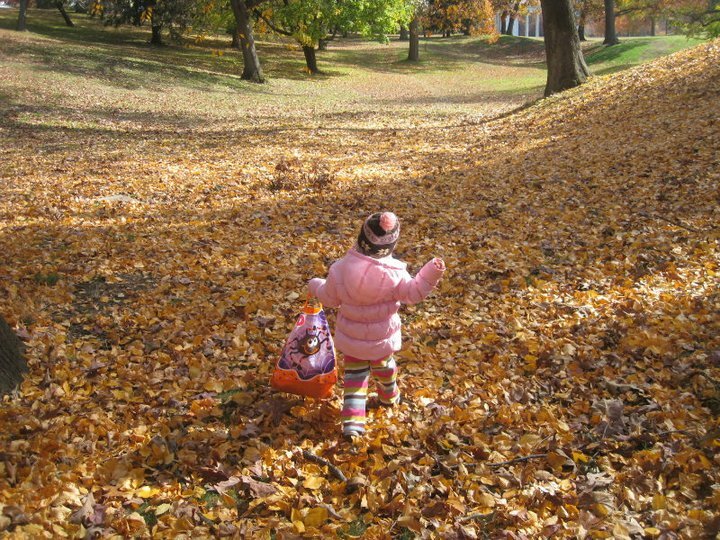 It's the first day of fall, as well as my nephew's birthday. I have mixed feelings about fall. On one hand, the leaves are beautiful, and it's not too hot. On the other, the days get shorter and WINTER is ever closer. Oh, and don't forget HALLOWEEN. Costumes and Candy and the Great Pumpkin, Charlie Brown! Day 2039 - What's Going ON in Here? Here's a picture of Savannah when we were out for dinner at the Nordic Lodge (where we pigged out on LOBSTER). Savannah really loved the lobster, by the way. She was playing kind of an "I'm gonna get you" game with Charlie, where she would touch him and he would jump. That would surprise her, and she would laugh and laugh. She loves to laugh! A few times Savannah was out on the deck, and the adults in the living room would start laughing at some joke. So - was she imitating you, Heather, or her other grandma? Day 2038 - Midweek and MidBITE! You may recall that the day before yesterday I talked about how much I love french fries. 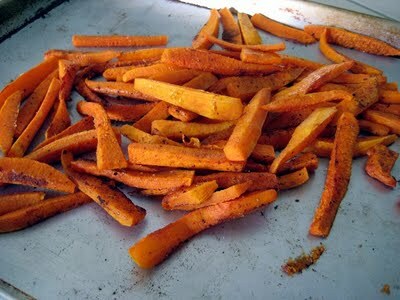 You may turn up your nose at this idea, but I MADE BUTTERNUT SQUASH FRENCH FRIES and they were actually good! Peeling a butternut squash is the hardest part of the job, and please be careful if you are not used to it. I sliced the squash in thin strips, sprayed them with butter PAM, sprinkled them with Tony's Cajun seasoning, then cooked them for 45 mins or so, turning them over halfway through. Absolutely yummy and WAY lower calories than potatoes. That's enough of a reason to try them. 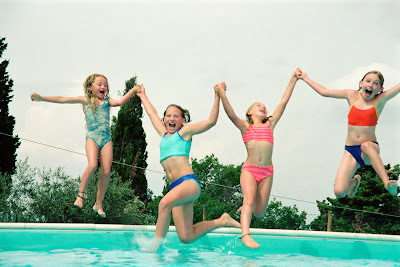 I have no problem with children learning how to swim and passing a swimming test so that they can be in the pool without their parent in there with them. I DO HAVE A PROBLEM with a parent bringing FIVE kids (four pre-teen girls and a younger boy) to the pool and LEAVING THEM THERE FOR AN HOUR FOR ME TO TOLERATE WHILE DAD GOES TO THE GYM and there was NO LIFEGUARD ON DUTY. 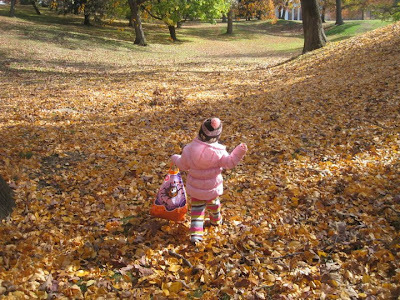 They were 'somewhat' behaved, but they were unsupervised kids! They took out all sorts of equipment which they used for floatation toys, not exercise tools, they shrieked and screamed jumped and splashed around us. They pretended the younger boy had cooties and was a shark, and basically took over the whole pool as well as the hot tub while Charlie and I were trying to have a peaceful exercise session. Just because I'm a parent - I worried the whole time that one of them would get hurt! Come ON, folks - BE THERE for your children! Day 2036 - Contain the Contagion! Greetings, Monday Morning Pandemics and Blahgers! We went to see 'Contagion' yesterday. Lots of stars in the cast like Matt Damon, Gwyneth Paltrow, Jude Law, Lawrence Fishburne, and Kate Winslet. Even Elliott Gould has a small role, I'll bet you haven't heard his name in a while! I thought it was good, Charlie thought it was so-so. Jude Law plays a blogger, so I'll give him an extra vote of confidence. A girl at the health club said she didn't want to see it because it was 'too believable', which scared her. I think it is worth a watch, or at least an excuse for eating movie theatre popcorn! I love french fries, waffle fries, texas fries, homefries, and most of all, SWEET POTATO FRIES. My favorite healthy brand is Alexia. I do believe I have died and gone to heaven, because Alexia now makes SWEET POTATO TOTS. I saw them in the store the other day. I haven't bought them yet, but I know they are AWESOME. 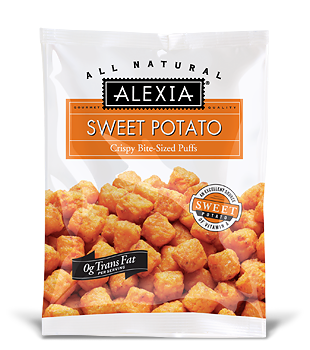 Well, I've liked all the Alexia potatoes I've tried so far, but I also read the reviews for the sweet potato tots online when I went to find a photo of the bag for the blog. Can't wait to HAVE SOME! Have a nice Sunday and TTFN! Day 2034 - A What? When? Where? You are NOT going to believe this (or maybe you are), but there was a HUGE rainbow that kept me company all the way to work YESTERDAY MORNING AT 6:30AM! I have never seen a rainbow at sunrise. I still can't believe it. I phoned Charlie and he went outside to take this picture. Thanks, Charlie! That is OUR mailbox - one end of the rainbow was right outside the house, and the other end was MILES and MILES away. When the sun finally came out the rainbow disappeared. That's a pretty nice start to the morning if you ask me! Day 2033 - The frozen tundra!! It is unusual to have cool weather here in September. I think the average high for this time of the year is middle 80's, and here it is, thirty degrees below it. Day 2032 - A new season of Survivor! 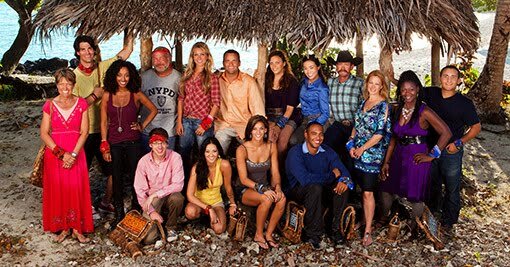 Can you believe that a new season of Survivor started last night? I still can't get used to Survivor being on Wednesdays. I liked Thursday better. He looks a lot like Russell too... Coach looks like his same annoying, egotistical self. We have a DVR this year because we got a cable bundle with cable telephone, internet and a DVR, and I really like to be able to rewind and rewatch. Have a nice day on YOUR island, wherever it may be! Day 2031 - Unhealthy or.... Another Adjective? Some people (none of my readers of course), look old before their time. Maybe it's genetic, maybe it's health, maybe it's due to environmental factors. We had a woman sit with us on the plane last Friday. She spoke to us, and was very nice and friendly. She was surely not more than middle aged, but she just had an old, tired look about her. Charlie's response 'Yeah, she looked pretty WITHERED'. It's hard for me to say this... Sometimes I am NOT cheap. Example #1 - I REALLY wanted hot dogs one night last week while I was on vacation. I had the hot dogs (red hot dogs from Maine) in the fridge, but NO hot dog buns. I admit it. I paid THREE DOLLARS AND TWENTY NINE CENTS in a convenience store for those dad-gummed hot dog buns. Eeeek! Example #2 - I wanted a bag of ice from the little store at the condo complex, and didn't care what it cost. They charged THREE DOLLARS for a bag of ice that should have been a dollar, AND didn't tell us we could have gotten free ice across the street. C'est la vie! So, there you go, I may need some therapy to recover from those expenditures, but on those two occasions, I didn't cheap out. Day 2028 - Survey SAYS! Greetings, Bloggy Surveyors and Purveyors! Before I get to my blog subject, let me say that yes, I know it is 9/11, and it still hurts me to think about it. It really does! I have TWO, count 'em, TWO survey items to tell you about, and both happened yesterday. First one - I filled out an online survey for Blogger regarding the new interface they are introducing. I tried the interface, it wasn't happy with my (bleep) Internet Explorer 9, and I reverted back to the original interface (which doesn't like IE9 either). Second survey item. 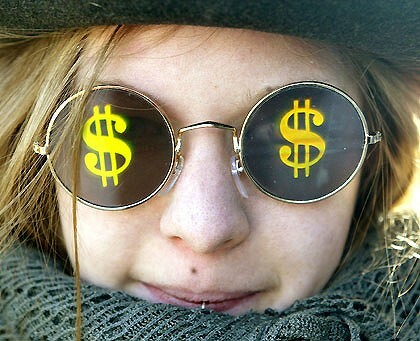 I made FIVE BUCKS CASH (let me say that again - FIVE BUCKS CASH) yesterday at my favorite dollar store (Dollar Mart Plus) by taking a survey about what I buy in a dollar store. 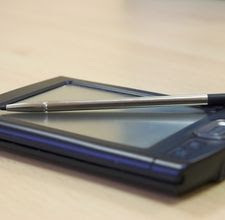 A man with a survey handheld (as pictured) asked the questions, and then used the handheld and a stylus to indicate my answers. I believe the point of the survey was to understand whether people are shopping more in dollar stores due to the economy (yes), what people are buying there (whatever is a good product and a good deal), and what types of items they would like to see more of in a dollar store. BOY did that guy pick the right person. Day 2027 - A fly on the wall...or in an airplane! Well, I am back from my whirlwind vacation. No, I don't always tell when I am away because it isn't a really good idea to blab that on the internet. Here's a couple of funnies from my trip home yesterday. A little girl sat behind us on the plane yesterday - and I don't think she stopped talking the whole way. I really liked the 'City of Tennessee' comment. The shuttle driver that took us to the airport told us about Paul McCartney coming to visit Newport sometime in the past. He mentioned that he arrived on his yacht, but had hotel rooms on land in addition to the 'water accommodations'. He added 'It didn't really look like a yacht a Rocker would have, it looked pretty conservative'. That's really funny to me - can one buy a 'hip' type of yacht? Day 2026 - No Time For Bloggage! I am off to the airport this morning to return home from my trip. I am changing planes somewhere, but don't need to worry about luggage because I am flying on Southwest. We LUV you Southwest Airlines! TTFN and catch ya tomorrow! You know you're getting old when you start packing your favorite brand of toilet tissue for your trip. That's kind of pitiful, isn't it? The worst toilet tissue I have ever experienced was in England at the McDonalds restaurant near the London Eye - it was exactly like thin sheets of wrapping paper or the gray, thin math pad paper we used as kids in math class. Remember that stuff? I also chose a restroom once that was OUT of tissue and had to use one of those paper tissue toilet liners instead. That was equally unacceptable. 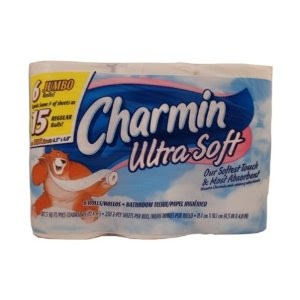 Mine is Charmin Ultra - in case you were wondering. There are BATTLES between people who love White Cloud and people who insist Charmin is softer. Okay, enough potty talk. The End. September 7th is our engagement anniversary (there was a much earlier proposal in Aruba that made me cry for several hours), with the presentation of an engagement ring over bread pudding at a restaurant named 'Yesterdays' in Newport, RI. 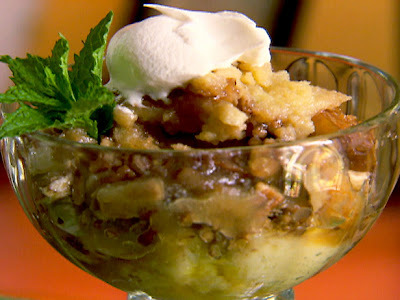 Bread pudding has had a special significance since then. I guess I should have photo-shopped a ring sitting on top of the whipped cream? Anyway - maybe we'll celebrate the day with some bread pudding, eh? I hope so! Do you remember the Mystery Date Game from the 60's? So - does the guy in the photo (this is one from the actual game) look like your dreamboat? 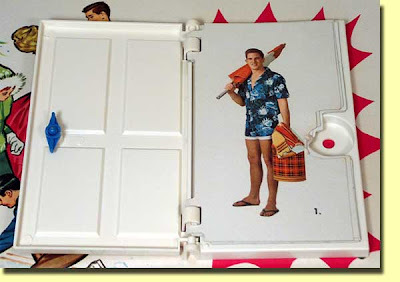 Anyone that shows up at my door in matching hawaiian print with a plaid thermal bucket would make ME very suspicious. 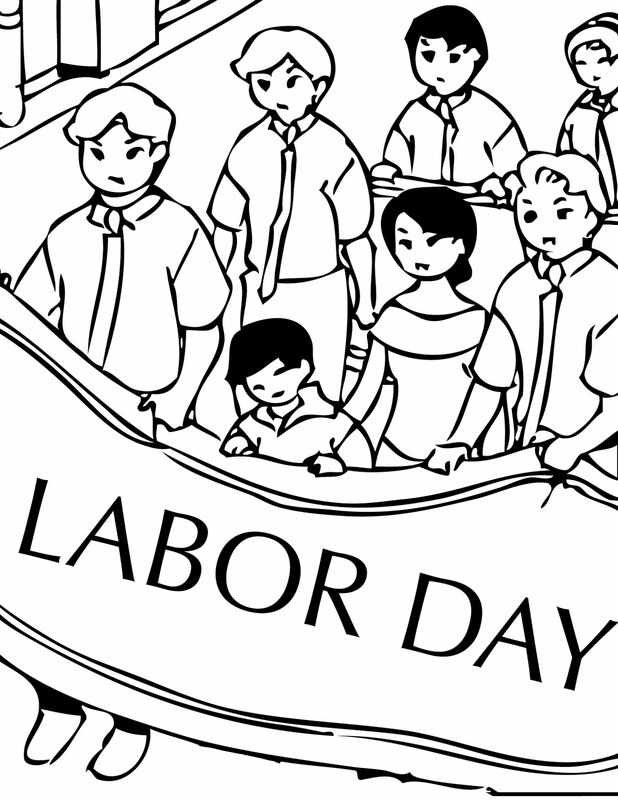 Day 2022 - Happy Labor Day! 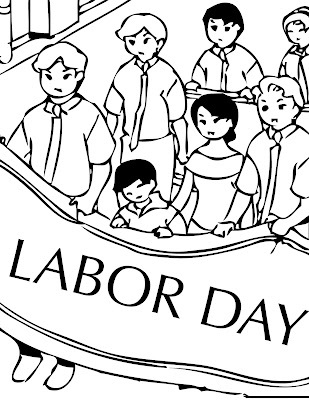 Do you usually have a Labor Day Cookout, or go to one? If I make macaroni salad, it needs to have celery salt in it, and green pepper, and ham sliced into little rectangles. Charlies sister makes really good potato salad that is very different from mine. The potatoes are nearly mashed once she has finished making it. Very creamy and rich. I'm not sure what we'll end up doing today, but I know we'll have fun. TTFN and have a great Labor Day! Areas in Maine (and across New England) lost power for a day (or more) during Hurricane Irene. I was on the coast of Maine at that time, at a retreat I go to every year. The kitchen was semi-operational due to the gas ovens and stoves. The chef hung Christmas tree lights around the kitchen which he rigged up to run from his truck battery. We all got free ice cream the next day because it was melting. My mother called it 'soft serve', which was more a consistency than the kind of ice cream. But guess what? 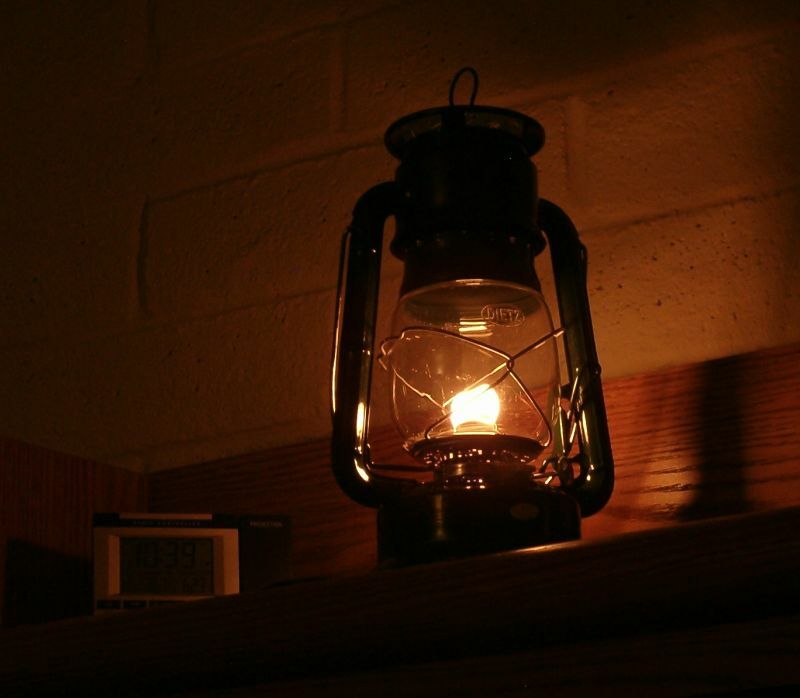 The darkest place on the earth during a power outage is a BATHROOM, and you are not going to avoid needing one. Invention Opportunity - emergency potty lighting would really be useful. They found a box of glowsticks left over from 4th of July and handed them out. We used 'halo' glowsticks as a substitute flashlight very successfully! My mother did have two small flashlights in her car, and those were great. Packing tip - flashlight with new batteries when we travel from now on. Thankfully my cell phone was fully charged prior to the hurricane, and lasted through my period of power outage. Day 2020 - It's NOT You! First - Happy Anniversary to my mother and stepdad! Love you! I have another story from our dining out experience the other day...You are all aware that some people have a routine, and any divergence throws them for a loop. Some people get up at 8am and go to bed at 10pm, and anything outside of those boundaries is difficult for them to deal with. Routine even applies to food, Charlie wants biscuits with chicken and cornbread with fish. That's just the way life is. The new, junior waiter interrupted a pattern this table of old ladies had followed for decades. They had a large table of women with an extra chair pulled up for the straggler of the bunch. There was enough gleaming, silver hair at the table to be visible from the space shuttle. 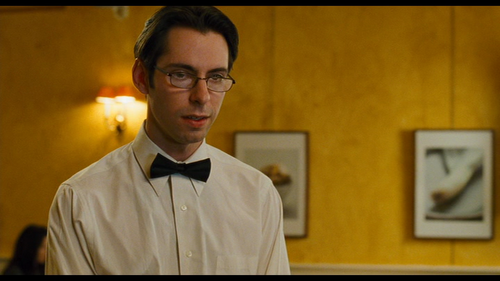 The young waiter did not change tables, but he did go get their regular waitress to come by and say hello to them. That mollified the women. Day 2019 - DON'T Change Your Mind Out Loud! The other morning we went out for breakfast at a place that offers giant popovers for breakfast. They were out of the popovers, which completely threw us into ordering mayhem. My mother exclaimed, horrified, 'They're GONE? You don't have even ONE?' She even pointed out the person in the room who appeared to have received the LAST POPOVER. We had a friendly-but-young 14 year old waiter, the son of one of the waitresses. He must not be used to all the hemming and hawing that goes on when something is NOT available. When I ordered, I said I was waffling in my decision of what to order. 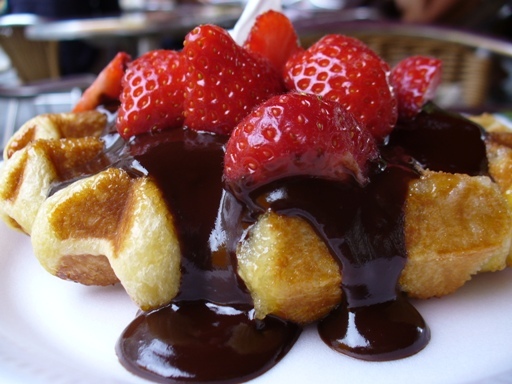 He answered 'A Belgian Waffle? ', and started writing it down! Ha! To make him feel better, I said, 'And don't bring me any popovers!' He very seriously said he wouldn't. First - Happy September! September is usually a nice month weather-wise, not as hot as August, and Fall hasn't quite Fallen yet. I'm not talking about eating too much, I'm talking about bulges that occur overnight in my SLEEP. 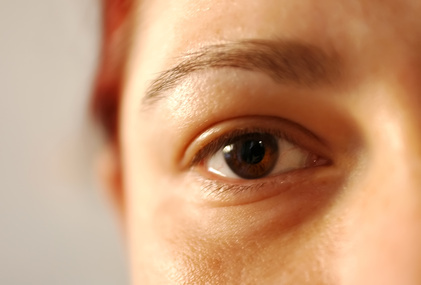 Sometimes I wake up in the morning and my right eyelid looks like elves inflated it overnight. It goes away after I've been up for a while. I tell myself that it happens when I eat too much sodium, but if that were true, it would happen every day. Help me, Obiwan Swollenator - why is this occurring?